The festive season is about to begin. In the meantime, Amazon and Flipkart have raised their waist for their annual sales. 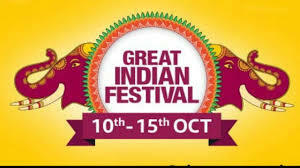 The Amazon launch of the Great Indian Festival 2018 cell will be held on Tuesday, October 9 at 12 a.m. This cell will last 11 o'clock 59 minutes on October 15. However, the Amazon Prime Members will be able to take advantage of sale from Tuesday 12 noon. Meanwhile, Amazon has disclosed the offer and discounts. Apart from this, the company will get an additional 10% discount on the use of the State Bank of India card. One of the most sought-after smartphones in these cells is the look of the smartphone. All customers buying a phone from Amazon India during the sale will be guaranteed mobile screen replacement. Apart from this, customers will be able to purchase the Total Damage Protection Plan for only 1 rupee. During Amazon Sale, new customers can get free delivery of their first order. There will also be no need for a prime membership. Amazon has partnered with OnePlus. The starting price of OnePlus 6 in the cell will be Rs 29,999. In this cell, all variants of OnePlus 6 will be sold for Rs 5,000. This offer is being linked to the launch of OnePlus 6T. Let's now tell you about the smartphone offer. Honor 7X will be sold at Rs 9,999, Huawei P20 Lite Rs 15,999, Vivo Y83 Rs 13,990, Moto G5S Plus 9,999, Honor Play will be sold at Rs 18,999, Huawei Nova 3i will be sold at Rs 17,990 and Samsung Galaxy S9 for Rs 42,990. Redmi 6A will be sold in the flash cell. However, it will be available only in its old price of Rs 5,999. Vivo V9 Pro will be made available for the first time, for Rs 17,990. Offers of Realme 1 and Redmi Y2 have also been revealed. Mobile accessories will be available in the Amazon cell at an initial price of Rs. 89. The starting price of the power bank will be Rs 399. The price of headphones will start at Rs 299. In the cell, its products of the Amazon brand, such as echo smart speakers, fire TV stick and Amazon Kindle will also be part of the cell. Speaking of other electronic products, laptops in the Amazon Grade Indian Festival cell will be available at a discount of Rs. 55,000. The camera will be available with an option of non-interest EMI. The Mi TV Pro series will be available for sale for the first time. The sale of these smart TVs will be held on 9th October at 9 pm for Prime Members.